TAG Peruvian Bellagio is one our great young Studs! He is a mix of two of the best fawn genetic lines in the country! His sire is Marathon, an EIGHT TIME HALTER CHAMPION. FULL ACCOYO MEDIUM FAWN! 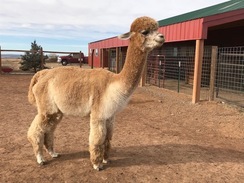 Marathon is one of a kind - this full Accoyo medium fawn male has "a next generation elite fleece," perfect head, bite and conformation. His fleece has a very high-amplitude crimp, is extremely bright, and well-bundled, with a long-staple length. Genetically, he is a fusion of Accoyo sires Caligula, Camilio and Auzengate (Australia). He has placed as Reserve or Color Champion in the first 8 out of 10 shows in his career, with 4 of the banners earned as a juvenile, all with blue ribbon wins. Bellagio's Dam is Blaithin, a gorgeous light fawn Jericho daughter who's maintained incredible fineness through her fifth fleece. Blaithin also carries PPPeruvian Augusto and PPeruvian Leon in her pedigree! Bellagio has done really well in the show ring taking two color championships, 1st place Bred and Owned 2yr old, part of a 1st place get of Sire, (4) 1st place finishes and (3) 2nd place finishes. Bellagio's one to keep your eye out for! We are only doing 10 outside breedings in 2012, hurry there only a few left! We are choosing to limit Bellagio's breedings to only 5 outside breedings per year! Kaos is a lovely female with density and a fine fleece at 4 years of age. Beautiful crimp style and handle to her fleece. She has a very nice conformation and is a big boned female. Great body capacity for carrying and birthing crias. Kaos is holding a good AFD of 19.6 as tested this year by FibreLux. 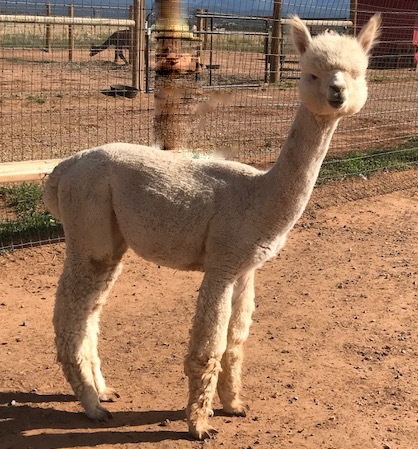 Her first cria, PJA Karina is a beautiful white female. Sired by our own PJA Golden Victory's Kiowa, Karina has already done well in the shows.